The Los Angeles Dodgers finished last season with a 94-68 record although they we knocked out in the NL Division round by St Louis Cardinals the Dodger Nation was still there to support their boys in blue on a nightly bases at Dodger Stadium as it ranked first in attendance with 3, 782,337 fans going to the Stadium. The cheapest Dodgers tickets last season were $2.00 per ticket while the most expensive Dodgers tickets were in the Dugout Club at $2,250.00 per ticket. Throughout the regular season the average price of Dodgers tickets on the secondary market was $19.00 on the low end and $95.00 on the high end. Here is a guide to the 2015 Dodgers Ticket Prices for their Home Games at Dodger Stadium, Opponent and one of the most important factors the Promotion or Giveaway for that night. Avg Price: $17.00 | Low Price $14.00 Although no giveaways or promotions when the Angels come to Dodger Stadium this season the cross town rivalry can keep Angels vs Dodgers ticket prices on the higher side still the average price per ticket is cheaper for Dodger Stadium games than the $40.00 per ticket average to see them play at Angel Stadium. The Dodgers vs Athletics Wednesday July 29th game will feature a bobblehead giveaway so prices for that game could end up being a bit higher than for the Tuesday the 28th. .
Avg Price: $33.00 | Low Price $12.00 Dodgers vs Braves ticket prices for their May 25th and May 27th games at Dodger Stadium will be higher due to the promotional giveaway of the Dodgers Garden Gnome on the 25th, and Coaster Set on the 27th. Braves vs Dodgers on giveaway nights average ticket price is $37.00. Avg Price: $31.00 | Low Price $11.00 Last season the Dodgers only won once in the six times they played. The Saturday night game on July 11th is Bobblehead night #5 while the Sunday game on July 12th is Kid’s Hamper giveaway. Avg Price: $30.00 | Low Price $15.00 The Dodgers vs Cardinals games will see three giveaway nights at Dodger Stadium in the four games played. The June 4th Bobblehead #3 giveaway and June 6th Kids Cereal Bowl will both be big games. Avg Price: $32.00 | Low Price $22.00 When the Cubs come to Dodger Stadium in August two of the games will be promotional nights with the Aug 29th game being Collectors Pin for Cy Young winner Orel Hershiser. Dodgers vs Cubs ticket prices will be higher because the Cubs only play three times in LA, the games are on the weekend as well as two being giveaway nights. Avg Price: $25.00 | Low Price $10.00 The Diamondbacks and Dodgers will play ten times at Dodger Stadium with five o f the games being giveaway nights including the last bobblehead giveaway night on Sept 24th, Sleeved Blanket, Dodgers Tote Bag, T-Shirt giveaway and Yasiel Puig Replica Jersey giveaway. DBacks vs Dodgers ticket prices tend to be higher on the giveaway and promotional nights Average ticket price is $36.00 per ticket and Low Price is $14.00 per ticket on average. Avg Price: $47.00 | Low Price $20.00 Besides winning the World Series the Giants vs Dodgers ticket prices have always been on the high side do to the rivalry. The 2013 average ticket price for a Giants vs Dodgers game at Dodger Stadium was the lowest in years at $24.00 per ticket. If you went to see them play at AT&T Park the average ticket price $74.00. The Giveaway nights which include Cy Young Collectors Pin of Don Drysdale, Fleece Blanket, Fathers Day BBQ and Bobblehead number #8 will have a higher average ticket price and higher low end price by 10 to 20% depending on the game. Avg Price: $45.00 | Low Price $14.00 There will be much stronger demand for the Mariners vs Dodgers tickets on the April 15th Wednesday night game will have due to the Adult Jackie Robinson Replica Jersey giveaway night. Low end ticket prices can start around $20.00 per ticket. Avg Price: $20.00 | Low Price $10.00 The Marlins vs Dodgers game on May 12th will feature the first bobblehead giveaway night of the 2015 regular season. Once announced the lower end ticket price can raise as much as 110% percent to around $20 per ticket and average ticket price for that game is $39.00 per ticket. Avg Price: $31.00 | Low Price $15.00 The July 4th game between the Mets and Dodgers will have a higher low end price due to the game being on a Saturday Night as well as July 4th and a fireworks show. The lower price can run for that game can start around $27.00 per ticket. Avg Price: $29.00 | Low Price $15.00 The Nationals vs Dodgers ticket prices for the August 8th game will tend to have a higher “get in” price of $17.00 and average ticket price of $32.00 due to the Fernando Valenzuela Cy Young Collectors pin giveaway. Avg Price: $29.00 | Low Price $15.00 The Padres vs Dodgers ticket prices for the April 6th game which is the Dodgers Opening Day game for the 2015 regular season will have a higher average ticket price range from as well as a higher “Get In” lower end price due to the demand for Opening Day Tickets. The lower price range for the other four promotional giveaway games which include Replica Dodgers Pullover Jacket, Bobblehead #2 and closing day of the regular season which is fan appreciation day can average $21.00. Avg Price: $42.00 | Low Price $17.00 The Phillies vs Dodgers ticket prices for the July 6th game which is bobblehead giveaway #4 can have a higher “Get In” price of $20.00 per ticket as well as the July 8th Hello Kitty Plush giveaway away night. The Hello Kitty giveaway nights are one of the strongest promotional nights year to year at Dodger Stadium. Avg Price: $25.00 | Low Price $14.00 The Pirates vs Dodgers ticket prices will be higher on average for their Saturday September 19th game by about 20% due to being late in the season as well as a weekend game. The September 20th game is honoring Clayton Kershaw and attendees will receive a Cy Young Collectors Pin. Both the average price and get in price for this game will be about 20-30% higher than normal and if Clayton is pitching on that day price averages can go higher. Avg Price: $25.00 | Low Price $12.00 The Rangers vs Dodgers game on Thursday June 18th will be slightly higher than the June 17th game do t the Collectors Cy Young Pin for honoring Dodgers Mike Marshall. Lower end Get Ins for that game can start about $17.00 per ticket. Avg Price: $34.00 | Low Price $13.00 The Reds vs Dodgers ticket prices will vary for each game due to the promotional giveaway and being played on a weekend. The Aug 13th Thursday is bobblehead #7 giveaway and ticket prices can start around $20.00 per ticket. The Saturday night game can start around $14.00 per ticket and the Sunday game is a promotional giveaway and possible day game can start around $15.00 per ticket. Avg Price: $45.00 | Low Price $13.00 The Rockies vs Dodgers ticket prices can fluctuate 30% or more on both the average price range and low end get in the door price range depending on the giveaway night or weekend game. While the April 17th game can have $10.00 to $11.00 “Get in” price the May 14th game honoring Sandy Koufax can average $14.00 Get In the door price and the May 16th Rockies vs Dodgers game attendees receive a 1965 World Series Replica ring bringing the average lower end Get In up to $26.00 per ticket. Dodger Stadium address is 1000 Elysian Park Avenue Los Angeles, California 90090-1112. Barry’s Tickets offers Dodgers Parking Passes for all games. Feel free to find out more information about Dodger Stadium or about Dodgers Parking Map. Barry’s Tickets is located minutes from Dodger Stadium. Our downtown office next to the Staples Center makes it fast, easy and convenient for picking up or purchasing LA sports tickets even after the game starts Barry’s Tickets Los Angeles office is open from 9am – 9pm seven days a week inside the Luxe Hotel. Barry’s Tickets has been the go to ticket broker for all LA Dodgers Tickets as well as all Los Angeles Baseball Tickets for over 30 years. Dodgers Tickets Price Buying Guide For 2015 Subject to change. All Dodgers tickets are guranteed to be authentic and delivered on time. You can veiw the Dodgers April Schedule of games at Dodger Stadium. Also checkout our Dodgers 2015 Bobbleheads giveaway schedule! On Monday April 21st the Dodgers face the Philadelphia Phillies for the first time this season at Dodger Stadium! With tickets starting at just $5.00 per ticket here is a great way to save even more! Use this code on two $5.00 tickets and see what happens! Use BTSEAS10 on April 21st Dodgers Vs Phillies Tickets marked BV and get $10.00 off from Barry’s Tickets. This is good only on the April 21st Dodgers Vs Phillies Game! use BTSEAS10 on tickets marked BV and save $10.00. This discount is good while supplies last and some restrictions may apply. This discount is only good on Dodgers Vs Phillies Tickets on April 21st at Dodger Stadium. Discount is good online only and cannot be used over the phone. This discount is good only on tickets marked BV (best value). Barry’s Ticket Service has Dodger Tickets starting at just $5.00 a ticket! We are open from 9am till 9pm and sell tickets to all events past starting time or while supplies last. Barry’s Tickets is located just minutes from Dodger Stadium! Open 7 days a week, 9am – 9pm, for pickups. Bob Kelly Abreu or “Bobby” was born on March 11, 1974, in Maracay, Aragua, Venezuela. He is a professional Major League Baseball (MLB) right fielder player that was playing for the Los Angeles Angels of Anaheim. Abreu is nicknamed as “El Comedulce” and also “La Luche” and a two-time All-Star, won a Gold Glove Award and a Silver Slugger Award. Bobby Abreu was signed by the Houston Astros as an amateur free agent in 1990 and he debuted in MLB on September 1, 1996 for the Houston Astros. Abreu played for the Houston Astros in 1996 to 1997, but traded to Philadelphia Phillies which he began playing in 1998 to 2006. He was traded again to the New York Yankees and played for two seasons (2006 to 2008). Leading the league games was one of his greatest achievements. Bobby Abreu was major league leader in defense among active players in outfield assists. Abreu is also one of the active ballplayers in doubles, third in walks, at stolen bases he was in sixth and he was ninth in on-base percentage. He is also famous for his plate discipline when he led the American League in 2009 by his percent in pitches. 2005 Winner of the Home Run Derby at the MLB All-Star game. 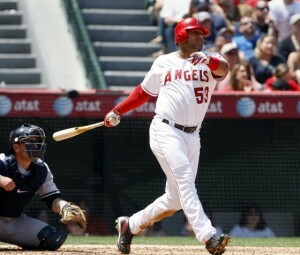 You can see Bobby Abreu and the the rest of the Los Angels Angels when you purchase Angels Tickets from Barrys Tickets.com. We stock all Angels Games at Angels Stadium as well as all Angels Road Games. The Super Bowl is the final contest of the NFL professional football season and determines the league’s annual champion. Currently the Super Bowl routinely finishes among the all-time top 50 programs in television ratings, and the 2011 game was no exception, setting a new record for the biggest American TV audience for a single broadcast, some 111 million viewers. Now probably the most important single-day sporting event in the United States, the Super Bowl had more modest beginnings, as did the sport itself. Football in America had its start in a game November 6, 1869, when Rutgers and Princeton played a college soccer football game. The game used modified London Football Association rules. During the next seven years, rugby gained favor with the major eastern schools over soccer, and modern football began to develop from rugby. At the Massasoit convention, of 1876, the first rules for American football were written. It was here that Walter Camp, who would become known as the father of American football, first became involved with the game. In 1902, baseball’s Philadelphia Athletics, managed by Connie Mack, and the Philadelphia Phillies formed professional football teams, joining the Pittsburgh Stars in the first attempt at a pro football league, named the National Football League. The Athletics won the first-night football game ever played, 39-0 over Kanaweola AC at Elmira, New York, November 21. All three teams claimed the pro championship for the year, but the league president, Dave Berry, named the Stars the champions. Pitcher Rube Waddell was with the Athletics, and pitcher Christy Mathewson a fullback for Pittsburgh. The first World Series of pro football, actually a five-team tournament, was played among a team made up of players from both the Athletics and the Phillies, but simply named New York; the New York Knickerbockers; the Syracuse AC; the Warlow AC; and the Orange (New Jersey) AC at New York’s original Madison Square Garden. New York and Syracuse played the first indoor football game before 3,000, December 28. Syracuse, with Glen (Pop) Warner at guard, won 6-0 and went on to win the tournament. In 1903, the Franklin (PA) Athletic Club won the second and last World Series of pro football over the Oreos AC of Asbury Park, New Jersey; the Watertown Red and Blacks; and the Orange AC. Changes ensued over the next 6 decades — with names, teams, players, and conference alignments coming and going. And in 1967, Congress approved the AFL-NFL merger, passing legislation exempting the agreement itself from antitrust action, October 21. That same year, the champions of the American Football League (which merged with the NFL in 1970) and the NFL met in what was called the AFL-NFL World Championship Game. The name was later shortened to Super Bowl, named after a child’s toy, the Super Ball. In this first game, the Green Bay Packers beat the Kansas City Chiefs, 35-10. The Los Angeles Coliseum, site of the game, fell far short of a sellout, although tickets were only $10 each. The National Football League’s Super Bowl XLVI will take place on February 5, 2012, in Lucas Oil Stadium in Downtown Indianapolis, Indiana. It will be the NFL’s 46th annual Super Bowl. Kick-off is scheduled for 6:30 p.m. Eastern, 5:30 p.m. Central, 4:30 p.m. Mountain and 3:30 p.m. Pacific time. Lucas Oil Stadium opened in August 2008. The normal seating for the stadium is 63,000 but will be increased to more than 70,000 for Super Bowl XLVI. The stadium cost approximately $720 million to construct and features a retractable roof and a unique large window at one end of the field. Now’s the time to get your 2012 Super Bowl tickets! Super Bowl XLVI takes place at the Lucas Oil Stadium, and it marks the first time that Indianapolis has played host. Super Bowl tickets are never around for long, so score yours now and watch NFL history in the making! Super Bowl Tickets for the Giants Vs Patriots rematch on Feb 05, 2012 are on sale now.